Danny Kirschner: a year without plastic. Part I. Try to think about how much you use single-use plastic and then imagine going one year without it. Seems almost impossible right? 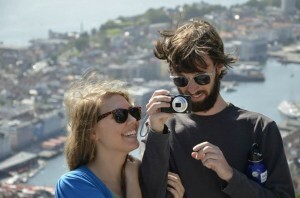 Danny Kirschner, 27, from Athens, USA (@anosinplastico), has set himself the goal of doing precisely that. Team Pacific Rowers caught up with the rock musician and environmentalist to see how he is getting on. Danny with Erin (and an aluminium canteen) in Norway. I’m 27, from the south of the US. After high school I made my way to a liberal pocket in Georgia called Athens (home of REM, B52s, Widespread Panic and more), with hopes of being in a rock band and graduating from UGA. I did both and found myself drawn into the world of tech startups and entrepreneurship after graduation. On the environmentalism side, it all started with a few key friendships with people who focused on diet, travel, buddhism and yoga. These thoughts eventually crept into my own being, and I became pescatarian last year, and eventually gave up seafood a few months back. Being antiplastic is pretty similar to being a vegetarian – drawing a clear cut line in terms of what’s acceptable to purchase and what’s not. It’s really simple once you draw that line. In short, I’ve learned too much. Unfortunately for many corporations, governments and bottled water companies out there, I watch documentaries and believe what many of them say. While TV has destroyed many good habits, it’s also led to the Golden Age of entertainment, aka Netflix. Once you’ve seen all the new releases, there’s all those documentaries on demand about every problem you can think of in our world. I’ve really been drawn to people who are movers and shakers in the community, who go out of their comfort zone to make the world better. 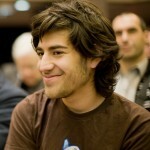 One of my biggest influences over the past year has been the writings and actions of Aaron Swartz. I admit I didn’t know him before hearing about his untimely death. One of my friends was really shaken up by the death of someone whom he praised as doing all he could for the common good, so I went digging into him. He was a lot like me, but of course much more successful and genius. He died on my birthday this past year. We were both 26. 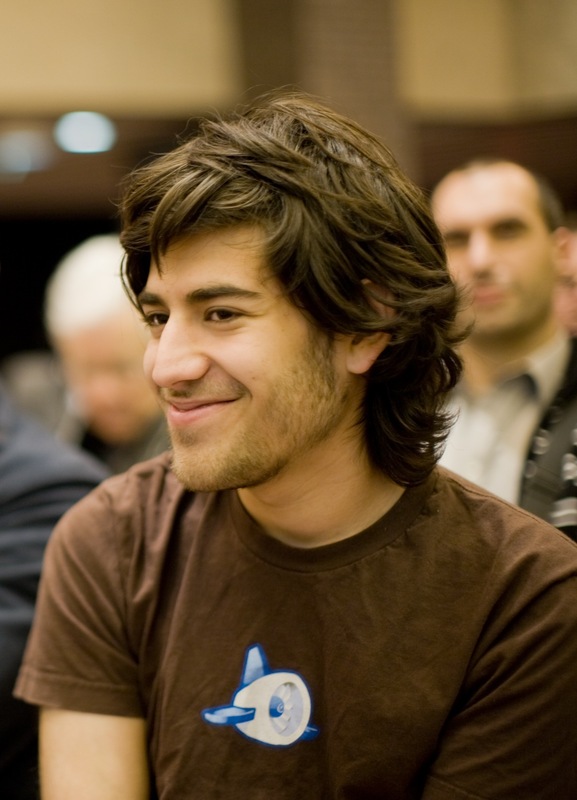 He co authored the RSS 1.0 specification as a teenager, co founded Reddit, and had just hacked into the MIT libraries to free a bunch of information that was supposed to already be free. That was more than enough to peak my interest. I spent a long time browsing his blog, and one article stood out: www.aaronsw.com/weblog/productivity. I made sure to focus on making my time “higher quality” ever since. We’ve always heard the phrase “be the change you want to see in the world”. It makes so much sense, it’s so easy. All it takes is you doing what you want to get the outcome you believe the world needs. It doesn’t take a committee, a law, a grant, or your friends to lift a finger. If you think something should be changed, make sure you do that change. I read about a group of people making a film about the atrocities we are committing to the marine environment with all of our plastic waste. This group was trying to raise awareness and raise money for their project. They were full time on it, making an all or nothing go at it. I had also realised the amount of plastic we use is ridiculous and is leading to problems we are only now seeing, but will become much greater if our use of plastic continues in its current state. Plastic is a metaphor for how we (we as in the majority) live in our society. Buy it, use it, toss it, don’t think about it any more. I’m at Starbucks right now. Everything is served in a togo cup with a plastic top, or a sweet drink in a plastic cup with a plastic top and plastic straw. I was at Trader Joe’s earlier today. Some 95% of the produce and raw stuff is bagged and sealed. 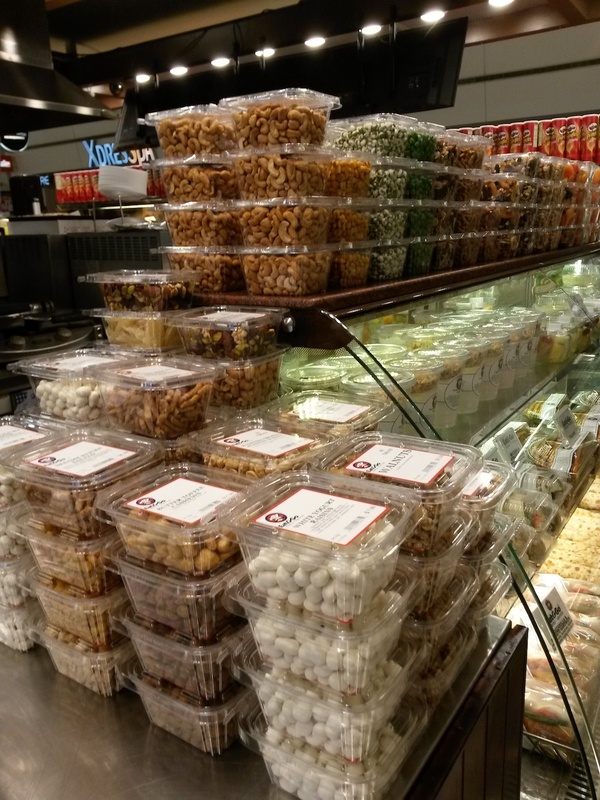 Yes they have paper bags for your groceries, but everything in the paper is wrapped in plastic. Plastic takes 500-1000 years to degrade. In the meantime it breaks into smaller pieces of plastic and eventually its toxic components that go into the environment. It fuels our dependency on oil. It pollutes our environments and destroys marine life. Plastic at the airport, snapped by Danny. So the question is, how can I not contribute to this? The answer seemed pretty clear: reduce, reuse, recycle. Be the change I want to see. It’s nothing groundbreaking, simply do the things others have outlined for me. I wanted to do something that I could accomplish myself, but also would cause people to take notice, even if it were just my friends and family. If you are going to put in effort to do anything, you might as well strive to be as effective as possible, which in this case means reaching as many people as possible. That’s why I’m doing a blog about it. The thought to try to live plastic free was a big enough idea that I knew it would ruffle some feathers and be worthy of blogging about, and that’s a start to getting the word out. I also wanted to try this in a city surrounded by normal consumers who will be challenged by my questions and choices. Since I’ve started the journey, I’ve found a few other outspoken opponents to plastic who live a plastic free life and live to write tips and stories from the battlefield. This is a great blog and resource for those thinking of ways to reduce your plastic usage: myplasticfreelife.com. How do you achieve ‘Plastic Free’ and how has it gone? Well it’s a lot like going vegan while surrounded by carnivores. When I’m with others (friends and family) at the store, around holidays, etc, I have to compromise. I make sure to look for alternatives, but can’t argue if someone else is paying the bill and prefers a certain packaging. I’m pretty laid back about it right now. What I really focus on is the main, definable purpose that I’ve finally reached: no one-time-use plastics, unless it’s for health reasons (something medical, I’m starving, I’m dehydrated). Again, at this point in time I’m only focusing on myself. This process of consumption awareness comes from internal realisation, not from external laws. This simple rule has allowed me to cut out probably 95% of my plastic usage. It’s also led to some interesting positive discoveries, such as the no plastic diet (post from my blog: yearwithoutplastic.wordpress.com/2013/09/03/the-no-plastic-diet/), which basically forces me to eat good food. Besides eating, purchasing other goods is also something to be wary of. I found a loophole in my rules: I can still have nice plastic things, as long as they aren’t one time use. I can buy a new phone because I’ll use it for a few years. But to stay true to the spirit of the antiplastic lifestyle, I am moving to only purchasing used goods. I think not pulling on the demand for new plastic goods is a positive and very attainable thing, that has the side effect of saving me money and making me less materialistic. All good things for me right now. This entry was posted in Uncategorized on January 7, 2014 by Colin Parker. Team Pacific Rowers, an entrant in 2014’s Great Pacific Race from California to Hawaii, has officially launched its #PlasticFree Campaign. The four Brits – Fraser, Sam, and James, who live in the UK, and Colin, who lives in New Zealand – want to complete the row to raise awareness of plastic and rubbish in the world’s seas and oceans, in particular the Great Pacific Garbage Patch. The route between Monterey and Honolulu will take them to the fringes of the patch, where trash from land and sea gets caught up in the huge rotating ocean current, or gyre. Four more ocean gyres across the globe act as circling conveyor belts for our rubbish, which is eaten by wildlife, deposited indiscriminately on coastlines, or simply bobs for thousands of miles, continually being broken down by sunlight and seawater but without fully degrading for hundreds of years. Rower Colin Parker said: “Taking on such an epic challenge as the Great Pacific Race affords us the opportunity to do some good, and highlighting a huge problem facing our oceans seems a perfect tie up. I am ashamed to admit that this time last year I had never heard of the plastic gyres, but the more you learn, the more you understand the tragic consequences. “But the silver lining is there are some amazing people out there who are dedicating their time, money and careers to getting our seas cleaner and raising awareness of the harmful effects of our dependence on plastic. Other groups carry out in-depth, long-term scientific research into plastic in our seas. We want to help publicise all of this. The campaign will mostly be about publicising the amazing work of people across the globe who are fighting the plastic menace in our seas, including beach cleaners and plastic abstainers. 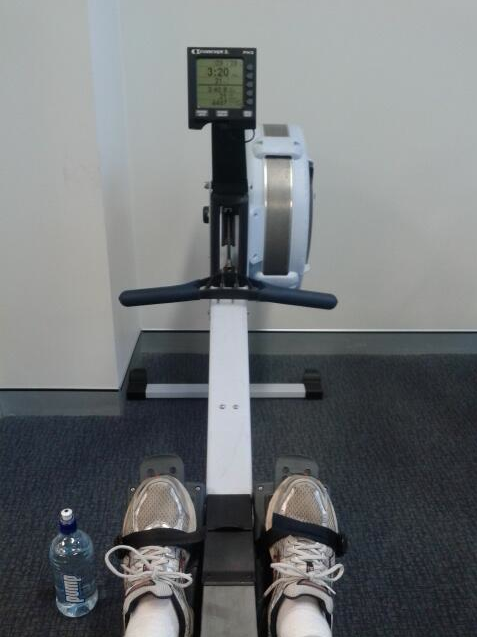 And Team Pacific Rowers will put its time where our mouth is. 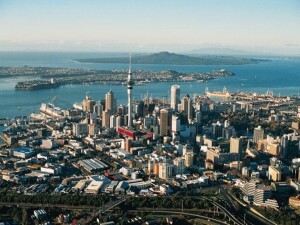 Colin will be dedicating two days a week to sea clean ups in and around Auckland’s Waitemata Harbour, in New Zealand. Each week two new blogs will appear on www.pacificrowers.com with interviews, information and beach clean up reports, and there’ll be plenty of and news-spreading on our social media pages @pacificrowers and www.facebook.com/pacificrowers. In the first week we will publish the first half of an interview with Danny Kirschner (@anosinplastico), a man from Athens, Georgia, who is attempting to go a year without plastic. 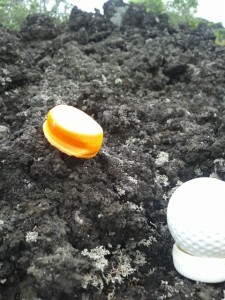 We will also have a blog from Colin about a plastic pick-up on Auckland’s beautiful Rangitoto Island. Team Pacific Rowers is a UK/NZ quartet hoping to become the first crew of four to row 3000 miles (2100nm/4500km) from Monterey, California to Honolulu, Hawaii. The crossing, which is scheduled to start on June 8, 2014, is expected to take the foursome five weeks to complete, during which they will row in pairs, two hours on two hours off, 24 hours a day. They are an entrant in the Great Pacific Race, organised by New Ocean Wave, and will battle against about 19 other teams, including solos and pairs, to become the first to Hawaii. The team is now looking for corporate partners to help fund the expedition in return for some exciting benefits, including naming rights, brand awareness, photography and video and more, further information on which can be found on our website www.pacificrowers.com. Any groups that would like to feature in Team Pacific Rowers’ campaign, or companies wishing to sponsor Colin’s volunteering, please email us at info@pacificrowers.com. For further details contact us at info@pacificrowers.com or visit www.pacificrowers.com. 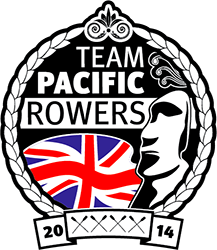 Our Twitter handle is @pacificrowers. This entry was posted in Uncategorized on January 6, 2014 by Colin Parker. With only 5 months to go before the start of the Great Pacific Race, we (and I’m sure all of the GPR crews) have been avidly following the Talisker Whisky Atlantic Challenge which is currently underway, taking crews from the Canary Islands off the north west coast of Africa to Antigua. 14 crews left La Gomera 32 days ago only to be hit by weeks of storms and heavy seas which saw numerous capsizes, resulting in shaken crews, cuts and bruises, equipment loss and failure and in a few extreme cases, teams have had to be airlifted to safety, leaving their boats bobbing around in the Atlantic. Crews have had to spend days locked in their hot, humid and cramped cabins with their parachute anchors out to keep safe from the seas. Emerging from the cabin when the weather permitted would find them having to reclaim lost miles. Following along with the highs and the lows of the Atlantic crews really does put things into perspective. 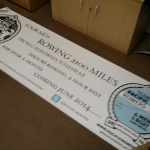 It’s very easy to get lost in the romance and excitement of 5/6 weeks at sea rowing from California to Hawaii. My mind is filled with thoughts of celebrations at achieving milestones, the sun rises, the sunsets, the starscapes, the pods of dolphins following us for days, the whales breaching next to us, the banter with 3 good friends and all the other highs we will experience as we chase the sun west. It is good then, that we are brought back to reality so we don’t get carried away. We are reminded that it won’t all be joyous. We’ll experience sores all over our hands, feet and bodies, exhaustion, sleep deprivation, unbearable heat and cramped conditions. At times we will even be in fear of our lives. A capsize, now seems a probability rather than a freak 1 in 1000 occurrence as I previously perceived it to be. I don’t think there is a single crew on the Atlantic Challenge who hasn’t experienced one yet. With the capsizes, along with equipment being lost to the sea, many of the Atlantic crews are reporting electrical failures due to water getting into the systems. An electrical failure has now moved from completely off my radar to my current biggest worry. If the electrics fail, we won’t be able to make water. If we had no water we’d have to pull out of the race. I’ll be the first to admit that I’m not much of a handyman, if we needed to start rewiring the electronics to get the watermaker functioning, I wouldn’t have a clue where to start. Luckily, we have a manual for our wiring system on board. I’ll surely be spending a lot of time on the boat with a knowledgable friend to show me at the very least the basics before we set off. One of the teams has even reported being attacked by a shark (or possibly swordfish) a few days ago. It seems the shark attempted a few taster bites before realising that the boat was inedible and moved on. Not before leaving a hole and one of it’s teeth in their hull. Any of my friends who have been swimming with me in the sea will tell you that I’m the first one to race back to shore if I see anything on the sea floor that isn’t untouched sand. Following the Atlantic race really has been an eye opener. I’ve been glued to the race tracker and eagerly read each of the crews’ blog updates the second they fall into my Feedly account. The event organisers have done an amazing job with the coverage of the race and I look forward to similar coverage of our race. Despite all the harsh realities that the Atlantic Updates have brought, they have also made me even more excited and impatient to make that first push off from the pontoon in Monterey. This entry was posted in Uncategorized on January 5, 2014 by Fraser Hart. That’s Rangitoto Island in the background. Rangitoto – at 600 years old the youngest island in the Hauraki Gulf – sits as a natural guardian to Auckland’s Waitemata Harbour. All vessels that sail towards and away from the downtown skyscrapers towards the Pacific do so under the shadows of the 260-metre high volcano. The jagged black rocks reaching out to the gulf at the island’s edges – which moat the world’s largest pohutukawa forest – bear testament to the island’s violently fiery birth. 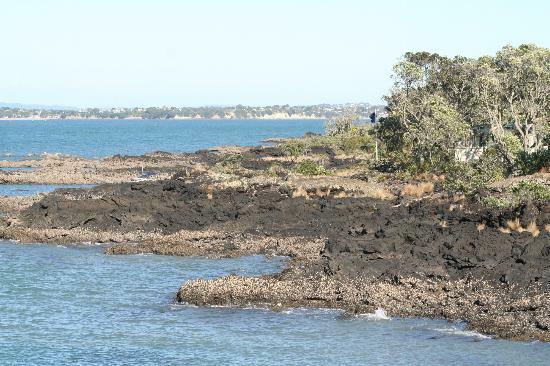 Its location and makeup combine to turn Rangitoto into a bit of a trash net for Auckland. 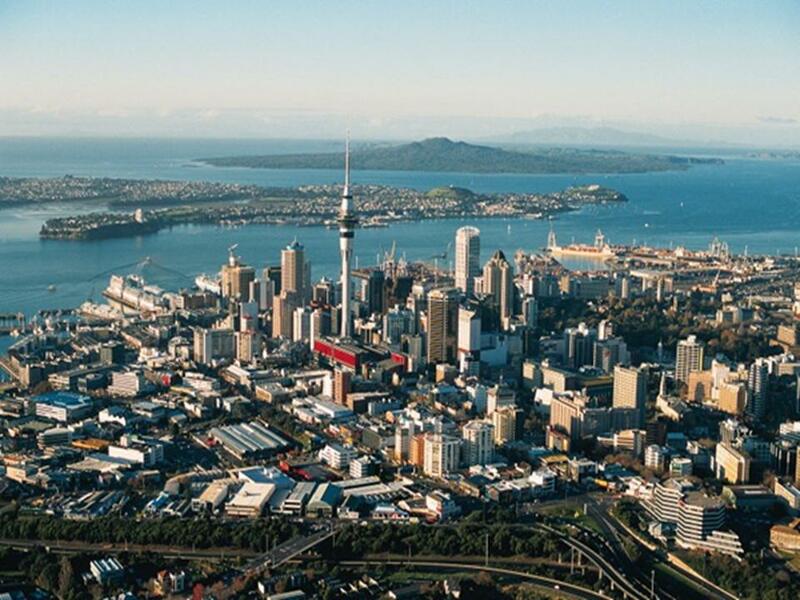 Rubbish is blown/dropped/flushed out by storm drains from the city and suburbs into Waitemata, from where currents take swathes of it towards Rangitoto, which means Bloody Sky in Maori. It’s good news for the sea, not so good for the beauty of the island. It’s one of the last points plastics will pass before leaving Auckland and venturing out into the Pacific. According to Adrift.org.au, after 10 years most rubbish leaving New Zealand ends up off the coast of Chile, in South America, while some accumulates off the coast of Queensland, Australia. On Tuesday December 3, at 7.30am, I joined Sea Cleaner, who are contracted by the Watercare Harbour Clean-Up Trust to keep the city’s waterways rubbish free, from berth U2 at Westhaven Marina in downtown Auckland. The original plan had been to go up Henderson Creek in the west of the city, but due to falling tides this was changed. We – four volunteers including regular David and a Danish and a German tourist, and the boat’s captain Ben Harris – were going to Rangitoto. Because it acted as a trash net for the harbour, the island is a regular destination for the clean-up crew and today is my third time there. The sea is proper choppy, so Ben guides the flat bowed Phil Warren II slowly over the retreating tide, past Brown’s Island to our right until we find a landing point. Against the black rocks in the distance it is possible to see quite clearly white plastic trash. Especially the garden furniture. The ocean collates the rubbish, which tees it up nicely to collect. Debris of all shapes and sizes ends up on Rangitoto, from the small clear nurdles that are the raw material for bags and other products, to tyres, to garden furniture, to kids’ toys. But from my first time on the island what really struck me was the amount of small debris there is: bottle caps; lighters; straws; cellophane wrapping from cigarette packets; tennis balls; clothes pegs; along with plenty of fragments of larger items smashed and broken down by the sharp rocks and shifting tides. To me this is evidence of items washed down storm drains from Auckland’s often brutal rain, which deposit the debris out into the harbour and then onto Rangitoto or beyond. Head out into the harbour one morning after a storm and you can see all this debris; the cellophane from cigarette packets, along with cigarette butts, are the most prevalent. Back to the clean up and like other areas we clear, the rubbish accumulates in specific spots, like the sea collates it for us and leaves it in easy to find batches. It’s its last-ditch attempt to get the trash out. We each take a blue sack and forage about and it’s never too long before you come across a large deposit of crap. A good way to spot it is to look for the easier to spot timber. Usually where this is found, there’s plastic. Finding plenty of rubbish feels good and bad: good because you can rid the island of a lot of plastic; bad because it is there in the first place. After about an hour and a half scouring just a small section of the 5.5km diameter island we are back on the boat, about a dozen large sacks filled with rubbish, along with a plastic garden chair and a plastic garden table. Rangitoto’s sharp volcanic rocks that splay into the ocean help trap rubbish. I found dozens of plastic bags, close to a hundred or so bottle tops of well-known soft drinks brands and dairy brands, a LEGO man, a decent looking rugby ball (that’s filled with water), lots of straws and stirrers, and heaps of polystyrene blocks. On the way back we stop off at Rangitoto’s wharf, which is pretty clean, before heading to the viaduct for a sweep through. Here it tends to be small debris too: fag butts; straws; stirrers, none of which will degrade completely for years and may too, at some point, make its way to Rangitoto Island, one of Auckland’s most valuable seacleaners. This entry was posted in Uncategorized on January 2, 2014 by Colin Parker. My Facebook messenger bleeped on my phone. I had received a message. It was from Sam: “Guys next week let’s get out on the water, I can fly in for the weekend.” Just two-hours later we’d confirmed the trip and logistics. Thankfully, Fraser once again volunteered to drive the 500-mile round trip from the south east to Cornwall (this time with no trailer and boat, piece of cake). I really am warming to the team, top lads! But I hasten to add not only lads. 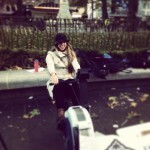 Claire Shouksmith, seasoned ocean rower, very kindly came along for the whirlwind trip and we’ll be forever grateful. Just 10 minutes with her in the boat and we realised how lucky and amateurish we are. But after a few hours we learnt some invaluable tricks about ocean rowing that made our 30-hour sojourn to Falmouth and back more than worthwhile. Thank you Claire. We crept slowly out of our sleeping bags at sunrise, necked some water and toast and put on our kit. The months between September and May give Fraser the excuse to wear his infamous ‘Long Johns’. A slightly nervy drive along Cornwall’s narrow roads was soon forgotten when Britannia Four was finally launched into the water at 9.15am, a wonderful moment for all (and Fraser’s camera). After a bit of wrangling with the seat, we were out of Penryn River and into Falmouth Harbour in no time, thanks to Claire and our first virgin ocean rower: Fraser. ‘1,2, 3’; ‘don’t break the knees until the arms are straight’; ‘lower your arms, too much shoulder’; ‘blades too deep’; ‘your timing is rubbish’, and on it went. We couldn’t have asked for a better day. It was glassy in the estuary and just light ripples beyond the coastline. Cruising between 2.5 and 4.5 knots it soon became apparent that even light, moderate ocean rowing makes you bloody hungry. Chris Martin, the organiser of the Great Pacific Race, can tell you all about that. We immediately re-calibrated our bearings for a fine pub in Helford River, but on arrival, no pontoon. A quick scout around still no pontoon. We made a rapid crossing to the other riverbank and found a pontoon but it was too shallow to get anywhere near it. Ocean Tides 1, Britannia Four 0. Bananas and Jaffa Cakes would have to do for now. After a great session from Sam and Claire – hugging the coastline closer on the return leg – brought us quickly back into the bay at Falmouth. So quick, in fact, we had to wait around for the tide to fully rise to get the boat out of the water. Ocean Tide 2, Britannia Four 0. Calories were all we could think about, and after a quick dash to the local Wetherspoons we refueled with burgers and beer and cheers’d our day away. They say every journey starts with a small step. We’re delighted to say our first few steps have now been made. This entry was posted in Uncategorized on December 12, 2013 by Colin Parker. This entry was posted in Uncategorized on December 10, 2013 by Fraser Hart. Last weekend, Sam and I had a very long Friday night when we picked up our boat, Britannia 4, from nr Headcorn in Kent and moved her over 300 miles to Falmouth in Cornwall. Finally arriving around 5am. This entry was posted in Uncategorized on November 24, 2013 by Fraser Hart. The day started at 2.30pm when I met Sam in a rainy Covent Garden. Sam was waiting under cover wearing just a pair of shorts and his Team Pacific rowers t-shirt and was fully loaded with a bevy of items we would need for the 24hrs. 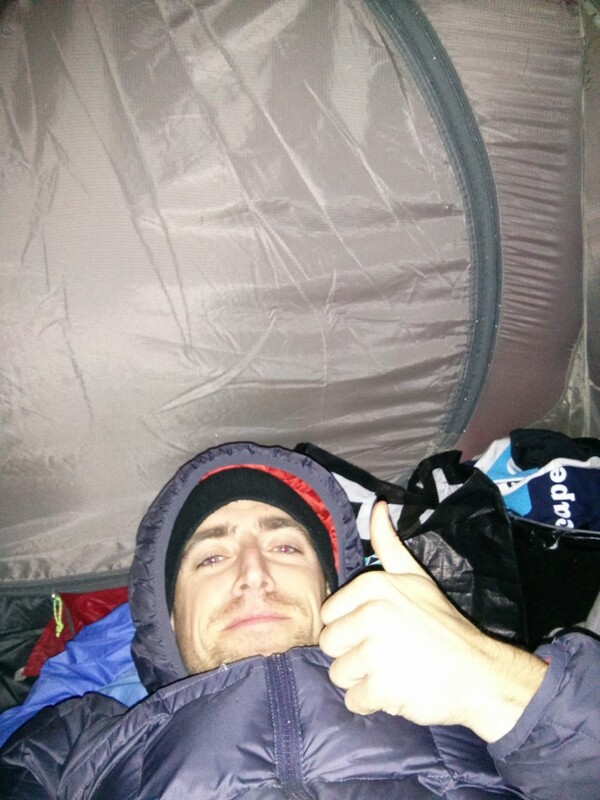 I was also laden with equipment, though between us, we didn’t have a tent. The inventory James was bringing with him in a few hours was also void of one. Our stuff was going to get soaked. We set out to trawl around Covent Garden’s many outdoor shops for a cheap ex-display or returned faulty tent but it seemed just as summer had gone, so had the supply of tents. It was looking unlikely that we’d be able to get our hands on even a brand new tent until we were met at the door of Jack Wolfskin by the very helpful Si. We explained to Si who we were, what we were doing and what we were looking for. He disappeared off down stairs and very quickly came back with a choice of 2 very high quality tents that he generously offered to lend us. 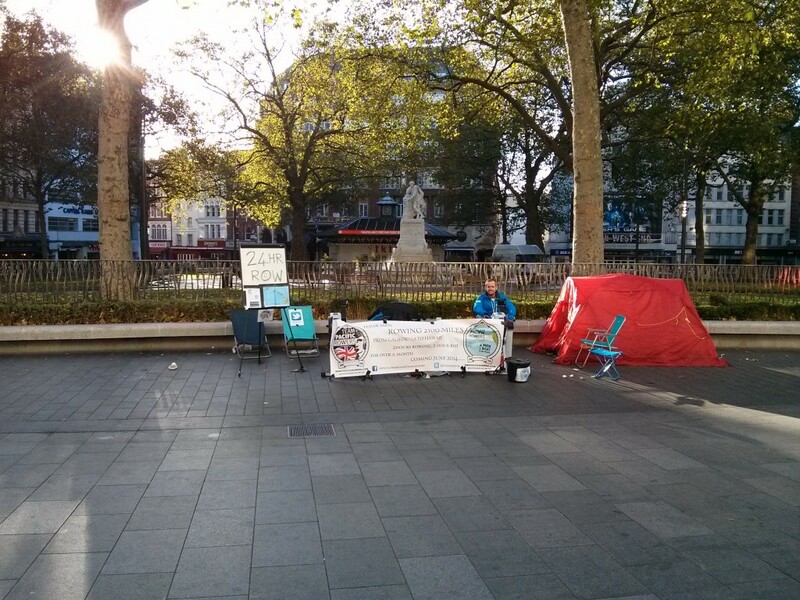 We opted for the freestanding dome tent, thanked him and made our way over to Leicester Square to pick our spot. Once in Leicester Square our spot was obvious.. right in front of the Empire cinema and casino. We had a chat to the doorman at the casino and he generously offered to watch our bags while we ran over to the Strand to pick up the rowing machines that Fitness First had agreed to lend us for the weekend. The lady on the front desk at Fitness First couldn’t have been more helpful. She showed us where the machines were, let us fill up our water bottles and gave us a few spares and within 10 minutes we were wheeling 2 Concept 2 rowers the half mile to Leicester Square. Within moments of putting the rowers down, the rain had stopped and we had gained some interest from Conrad and his Dad Marc. Conrad fancied trying out the rowing machine and he set off rowing at the same time as Sam started the first of his 4 2hr shifts while I got our pitch set up. Marc offered a hand with the pitch, which in the strong winds proved invaluable. I don’t think we could have got the banner rolled out and the tent put up without his help. Cheers Marc! Fast forward an hour and 15 minutes, the pitch was up and Conrad was still going and had clocked over 10km!!! 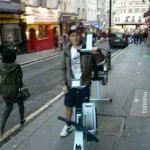 Still full of energy, he reluctantly left the rower and he and Marc left for a curry house. Sam rowed on for another 45 minutes then I took over for my first 2hr shift, during which James turned up laden with more stuff for the next 20 or so hours. James had brought a table and chairs which, in the strong winds, proved invaluable. We were able to move the gear supporting the banner into the tent for extra weight to prevent another episode of it lifting off the floor in the wind and attempting to fly to the other side of Leicester Square. I rowed my first uneventful shift and was glad to hand over to James to give my behind a rest. Even with the memory foam cushion I had brought from the boat, it was still very uncomfortable. During my shift, we got a message from Colin from over in New Zealand. While he wasn’t able to be with us in Leicester Square, he was doing his part in Auckland at his local gym. Clocking 4.5 hours to add to our 24. By now, darkness had truly fallen and the witching hour was approaching. We rowed on and on through the night squeezing in rest in the tent when we could but with the alcohol fueled activity going on around us, it was hard to relax and get any real amount of sleep. I managed around an hour the entire night. The overnight hours brought some, let’s say, “interesting” characters and situations; more Halloween zombies than you can shake a stick at, the Hare Krishna party in front of us for half an hour or so, the cowboy hat wearing thai chi performer who sat with us for an hour and then threatened to beat Sam up because he wouldn’t let him row while claiming he could row much faster than Sam and throwing a few un-PC insults at the time. Luckily the situation was resolved peacefully and he was on his way. After the hour’s sleep I did get, I awoke to be told of an incident with a lady sporting a broken bottle in each hand, blood covering each arm, wearing a blanket. She stopped at our notice board for a while and walked away to be apprehended by the police. We also met a couple of complete gems in Kadesha and Dwayne. They came over around 1am to see what we were doing and ended up sticking around until around 5am. A couple of very bubbly and entertaining characters, they kept us amused and in very high spirits with chaos going on all around us. They were also a huge help in our fund raising efforts, shaking buckets and talking to folk about what we’re up to. Massive thanks to those 2 guys (follow them on twitter: @RihannaNavyLdnX @DwayneOfficial). Shortly after Kadesha and Dwayne left us, the streets got quiet and the sun came up. We were happy to see the start of the new day. 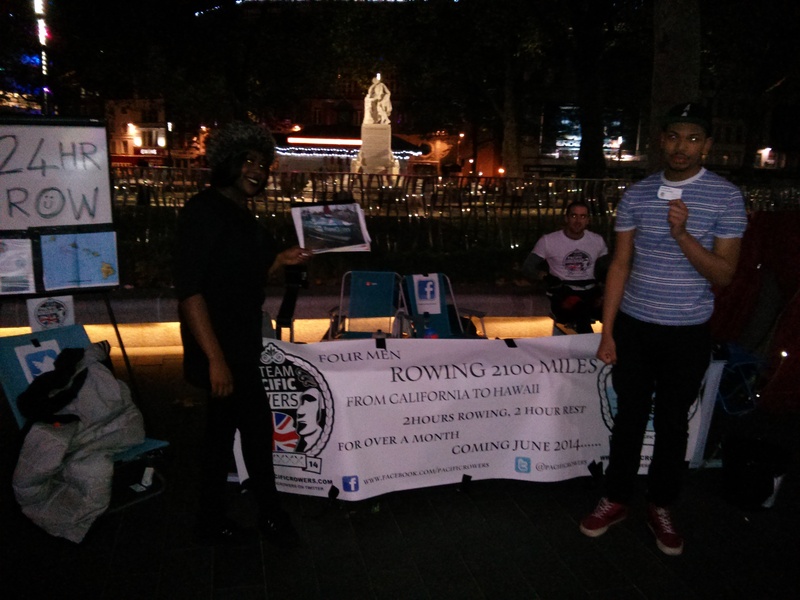 Footfall gradually increased and at around midday we saw our friends from the start of our row, Conrad and Marc. They were on their way to the science museum before flying back home to Germany and Conrad wanted to come for another row. 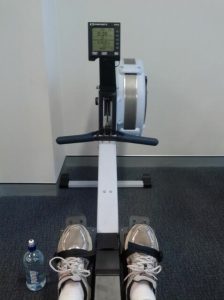 He rowed like a total boss for another 5km. By now we were on our final shifts. Sam was out first, then I finished my final 2 hours before handing over to James to smash out the last shift of the 24hrs which he did casually in a pair of jeans. We counted down the final 60 seconds with a number of revellers and then cracked open the beer to celebrate. 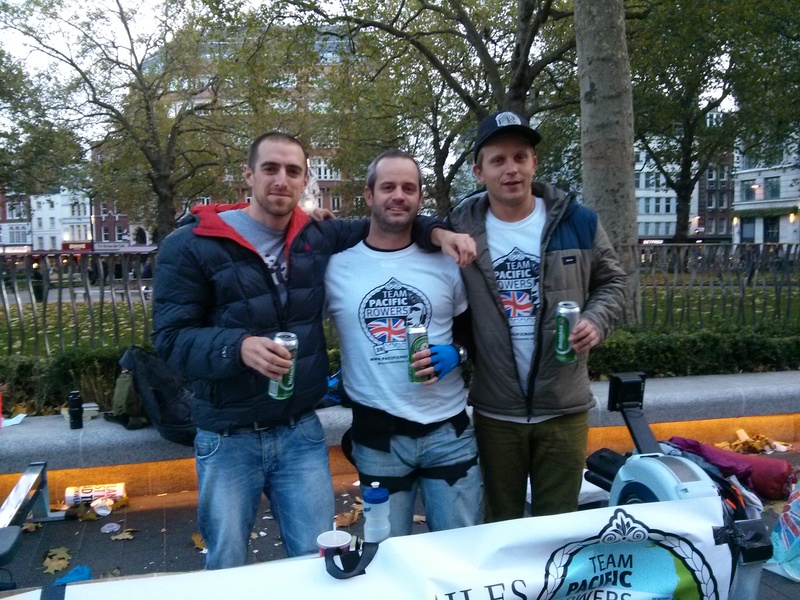 We were truly humbled by the kindness, generosity and sheer interest from the people in London this weekend. 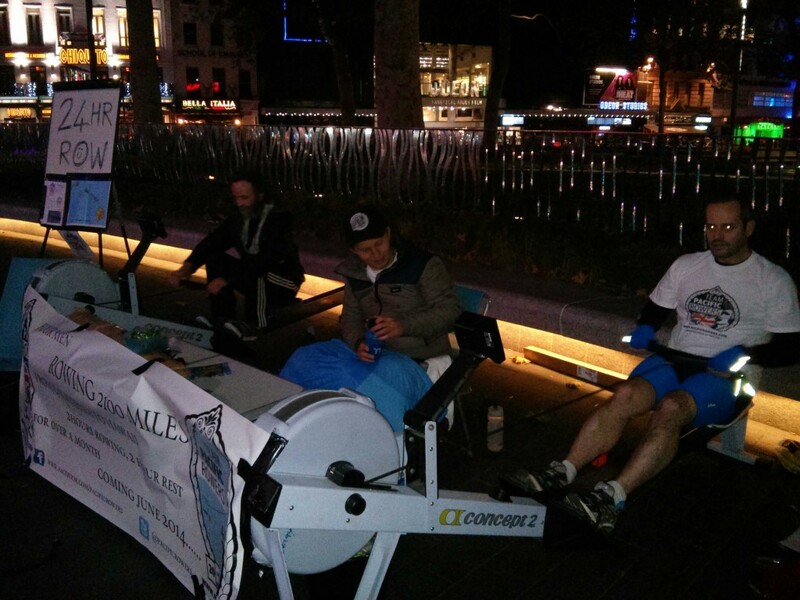 Huge huge thanks again to Jack Wolfskin Covent Garden for the tent, Fitness First on the Strand for the rowers and the Casino at the Empire for the use of the facilities and for watching our bags! Oh… and I got pooped on by a pigeon and some of it landed on my nose. This entry was posted in Uncategorized on November 4, 2013 by Fraser Hart. At very short notice, Sam, James and I (Fraser) are putting the final pieces of preparation together as we head in to central London to begin our 24hr row-a-thon. 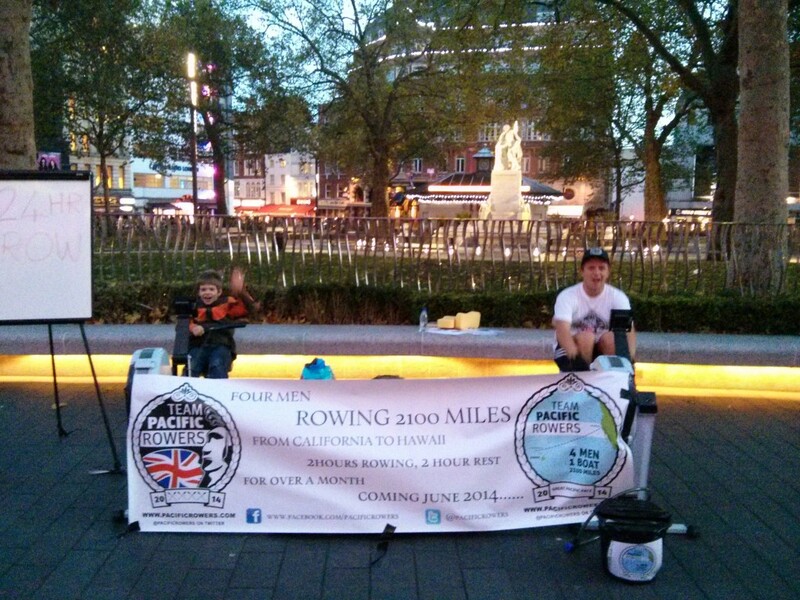 The idea of a 24hr static row was something Sam put to us in the very beginning of our campaign as a great way to gain publicity and raise funds for our expedition. We all agreed that it would be a great idea and a few dates were thrown about but nothing was settled on and the idea fell on the back burner. Then out of nowhere a couple of weeks ago, I got an excited phone call from Sam’s inner 12yr old on Christmas saying he’d put in an application to the council to do a row in the first weekend of November. We slowly started putting a plan together on the off chance that our application was granted and then on Wednesday, we got the official word that we had the go ahead. Trafalgar Square, Covent Garden and Leicester Square were thrown up as possible locations. We had our minds set on Leicester Square – for the footfall and lively atmosphere – so when the council agreed, we couldn’t have been happier. 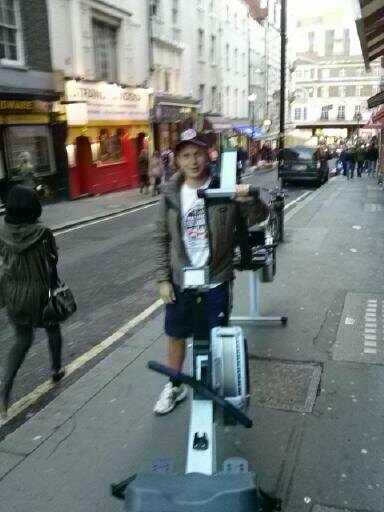 I’m meeting Sam in Covent Garden at 2pm and from there we are to head over to Fitness First on the Strand who have kindly offered to lend us 2 rowing machines. James has a marquee which he will be bringing at 7 when he arrives so we should have a nice little set up. We’ll also have pictures of our boat with us so come for a sneak preview before our official unveiling.were ecstatic. The banner was ordered for next day delivery and the wheels were put in motion. We’ll be alternating the rowing between the 3 of us (Colin, being in NZ will not be able to attend – though he has promised to punish himself on an ergo in Auckland) on a single rower and we’ll be offering the chance for members of the public to have a go and face off against each other in sprint challenges on the second machine. It would be great to see a lot of faces down there so if you are in the area, come and have a chat and challenge your friends at a sprint race. I’m off to try and find my cycling gloves and camera mounts and then get myself into central London. This entry was posted in Uncategorized on November 2, 2013 by Fraser Hart. Unbelievable as it may seem, it was not until about 18 months ago that I first tried frittata at a Halloween party at Halloween in north London. The hosts were a Spanish couple who insisted I taste their recipe. Of course, it was delicious and once I popped, I struggled to stop. 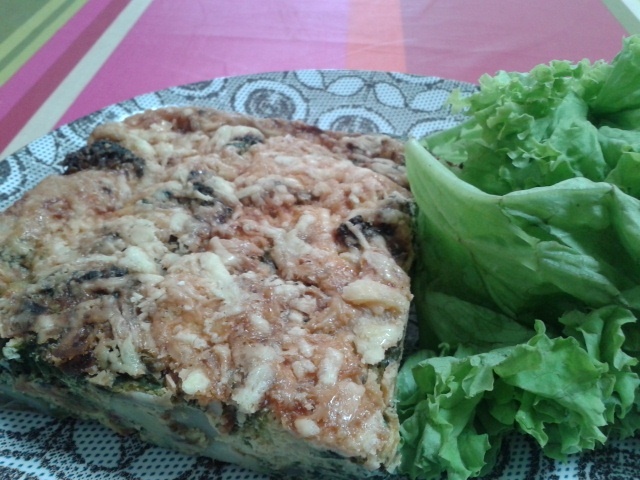 Only out of politeness toward the other guests did I finally step away from the frittata. I found this particular recipe on athletemasterclass.com after I Googled something along the lines of ‘nutrition for athletes’. It’s sold as a recovery meal following a hard training session as it is an excellent source of protein, balanced with some carbohydrate and other vegetables. 1. White onion was substituted for red onion or spring onions or scallions as I recently found out they are also called. Parker dislikes both the texture and flavour of white onion. He’s ok with it grated or very, very finely chopped, but ultimately prefers red or spring. 2. Cheddar cheese replaced with a mix of ‘Tasty cheese’ and parmesan– cheese in NZ tends to not to be named specifically. The cheese of choice in our household is quite simply called ‘Tasty’. Well, if the cap fits. 3. Sweet potato replaced with half kumara (NZ’s version of sweet potato) and half white potato. Parker is not hugely enamoured with kumara (I got eggy at the cost of it, jumped up potato: ed) but we had two that needed to be used up in the pantry (sorry Parker). It also added a nice splash of colour to the dish. The humorous shape doesn’t justify the price of a kumara. The world’s most expensive spud? The basic premise of the recipe is really good. Below are some suggestions for alternative ingredient/ cooking methods and having now cooked this twice, I can vouch that it is a quick and easy way to use up stray quantities of vegetables left over from a cook. For example, spinach works well and again, adds a delightful burst of colour as well as a little extra nutrition. Also, anything between four and six eggs is fine, so don’t panic if don’t have half a dozen to hand. · This dish was baked in the oven, however it can be cooked up in a frying pan with a metal handle, skip step 7 and add the eggs to the mixture in the frying pan. Cook till almost firm, then place under the grill to brown the top. · You can replace the sweet potato with regular white potato, and the broccoli with any other green vegetable you prefer. It also works well with potato, mushroom and tomato as the vegetable combination. · Pre-cook a puff pastry base to turn this into a quiche. Traditionally quiche doesn’t normally have potato, however this is an essential to include for the athlete to add carbohydrate and ensure it is a great recovery meal. What’s that? Sports nutrition with cheese? Oh go on then. For it’s simplicity, this dish is a cracker, and it keeps getting better, especially with the added greens inside. It’s almost like you are not eating them. I cannot imagine growing tired of this quickly, which is handy as another benefit is it is easy to move about: there’s no risk of it leaking out of Tupperware, and it can be eaten hot and cold. A regular for work. This entry was posted in Uncategorized on October 14, 2013 by Colin Parker. Raspberry Clafoutis Recipe on Danny Kirschner: a year without plastic. Part I.